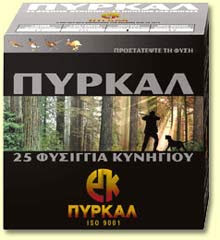 The EPK Machine Gun was designed by EPK, a Greek defense company (in English, "Greek Powder and Cartridge Company", GPCC) later known as Pyrkal. The gun's creation is connected to EPK's ambitions to become a major producer of infantry weapons and a relevant 1937 proposal to the Greek government. The proposal was followed by the development of a modern machine gun of EPK-own design, as well as construction of a small number of prototypes in 1939. The whole project, including building of infrastructure for massive production of the gun was underway when war with Italy broke out on October 28, 1940, and subsequent events prohibited its completion. A total of no more than (probably) 10-15 was built, their fate (except for one given as a present to a member of the Greek Royal Family) remaining unknown. Later publications suggested that this 7.92 mm weapon exhibited characteristics at the time closer to those of a submachine gun; others, though, including Pyrkal itself, have argued that the weapon was indeed a very advanced design for its time, featuring pioneering elements of a whole class of assault rifle types that appeared later. Its construction is close to the Thompson submachine gun with ergonomics and weight are somewhat compatible with the present day Ultimax 100 light machine gun.